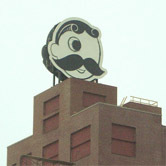 Struever Bros. Eccles & Rouse planned to unveil the newest "eye-con" watching over the citizens and activities of Baltimore City. A 27 x 30' replica of the Natty Boh man (of National Boehemian beer fame) was unveiled during a ceremony and celebration of the company's Brewers Hill business park in Canton. LH&A handled all public relations activities for the campaign, which included press release development and media relations. Event-day coverage included numerous local and business publications, and a helicopter from a local television station that covered the lighting of Natty Boh from the sky. The "eye-con" landed on the front cover of the Baltimore Business Journal's Heavy Hitters real estate publication and national trade magazines covering the sign industry ran features on event.